The streets leading to Piketon High School last Saturday morning were a bit busier than usual. That’s because the Redstreaks were hosting the Piketon Invitational cross country meet, and there were plenty of participants. 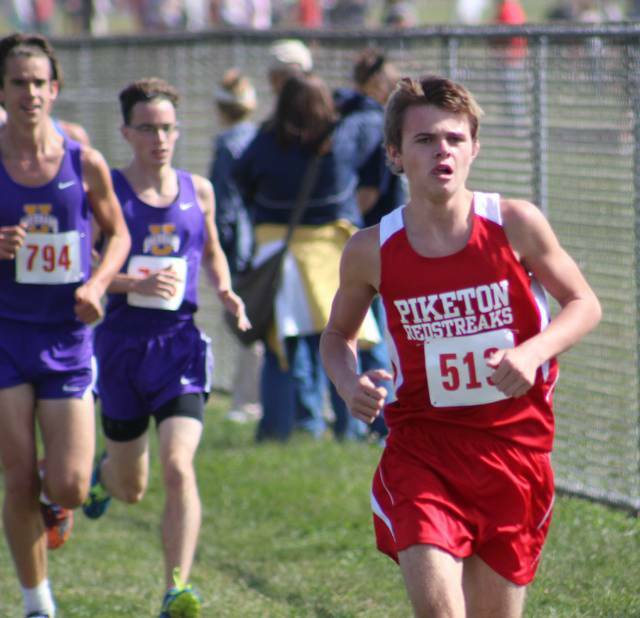 The flat, fast course at Piketon allows for runners to have some of their best times of the season. It’s safe to say that runners enjoy the course, too, as evident by the number of athletes who signed up this year. In addition to a great turnout overall for the meet, Coreno’s team put on a great performance as well. Senior Austin Taylor (17:26) finished 27th overall in the boys race, and senior Jacob Nichols (17:34) placed 30th in the same race. Junior Alex Blanton (17:59) came in 49th. Scioto County schools were well represented in the race, too. Portsmouth junior Aiden Kammler (16:29) finished sixth after finishing third in the Minford Invitational the weekend prior. His teammate, junior Daniel Clark (17:12), placed 21st. Minford junior Matthew Harris (16:53) played 11th, and freshman Dutch Byrd (17:39) finished 37th. Northwest freshman Landen Smith (17:09) finished in 18th, and freshman Josh Shope (17:45) came in at 40th overall. Rounding out the SOC schools, Waverly sophomore Aidan Judd (16:28) finished fourth, and junior Trevor Penrod (17:37) wound up in 33rd. Beaver Eastern junior Evan Leist (16:35) finished seventh. The girls race featured several SOC athletes who placed in the top 50 overall. Waverly senior Hannah Goodman (20:42) placed 22nd, and senior Leta Heigley (22:06) finished 46th. Oak Hill senior Bailey Ward (22:01) finished 44th. Northwest head coach Adam Schroeder, a former cross country runner at Shawnee State, liked what he saw from his Mohawks. Valley head coach Dale Foster was impressed with his team, too. Not only were teams from the area able to post great times, they were also able to get a look at some of the best cross country programs in southern Ohio. As a whole, cross country has grown considerably in Scioto County and the SOC. The growth is indicative of not only increased interest at Valley, but in the area as well. Foster expects the sport to continue to gain attention in years to come. Coreno feels that more fans are being drawn to the sport, too. The turnout was great for her team and her school, but Coreno says she couldn’t do it alone. The meet went a long way to prepare teams for the postseason, as the SOC meet takes place on Oct. 14 and the district meet is scheduled for Oct. 21.